Back in the days before sitting was outlawed as part of the National Health & Exercise Act of 2019, we had these things called chairs that we used to sit on, instead of being forced to stand for our own good, which only led to increased lower back pain and orthopedic health problems, but such is the way of things when politicians try to help us. Anyway, as a result, all chairs were collected and destroyed, except for those that were slated for museum displays or those owned by politicians and their families who were, as you might expect, exempted from the Act. Naturally, some people hoarded chairs, but these were frequently confiscated when annual fire inspections occurred, where fire safety compliance officers inspected your home, for your safety of course, and reported illegal contraband to the local police department or FBI, depending on the nature of the violation, which, of course, was for your own safety. Great view of the future – I am surprised that you did not include the exercise balls that are the exception to the no chairs rule. Then during your mandatory 15 minutes of exercise every two hours, you can use the ball to bounce and stretch, before getting back to work. 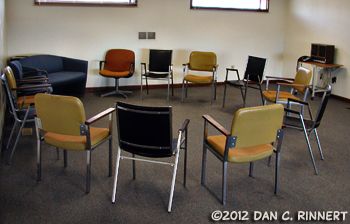 Looks like the chairs are just waiting for a support group! I hope we never lose chairs. I’ve seen the recommendation to sit on balls (and there are chairs that hold the balls too LOL), but I’ve also seen that doesn’t make a difference. At least for toning your abs anyway.